The following review is about a product called Lashfood Phyto-Medic Eyelash Enhancing Serum. It is formulated to nourish and enhance your lashes, giving them a longer, thicker, stronger natural look. The manufacturer claims that this product is safe, effective and without side effects. Phyto-Medic Complex contains herbal extracts that the manufacturer claims are clinically proven to prevent hair loss and trigger regrowth of lashes. Arginine is an essential amino acid for hair growth. Lavender water deals with a variety of hair issues including alopecia, while Soy protein strengthens, conditions and soothes lashes. To use this serum, apply it nightly onto clean, dry skin. Then, sweep the applicator brush along the lash line in the same manner as liquid eyeliner. Let the product absorb into the skin before applying additional products. The price is $80.00 for a 3ml bottle when purchased through the manufacturer’s website, and $90.00 from Amazon. Other retailers charge a lesser amount. For instance, there is one where the price of the product is $78.00. You would need to check various websites if you want a better deal if you end up wanting to buy this product. We must mention, however, that this cost is very high compared to other similar products. For example, one product that we reviewed recently only costs $35.00, and it is the highest price. Unfortunately, the money-back guarantee does not exist. What this means is that as there is no assurance that this serum will work for you, you cannot be refunded if you are unsatisfied with the results. Therefore, you will be purchasing it at your own risk. The lack of guarantee also shows that customer satisfaction is not the priority of the manufacturer and that they lack confidence in the effectiveness of their product. 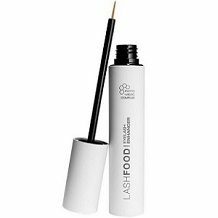 Lashfood Phyto-Medic Eyelash Enhancing Serum might be beneficial in nourishing and enhancing your lashes, giving them a longer, thicker, stronger natural look. You should start seeing results within 4 weeks of daily use, and one bottle can last you for a full three months. This is all good, however, the price is more than double the price of other similar products. We do understand that it will last you longer, but what if it does not work? Another concern is that the manufacturer states clearly that the product will make your lashes look longer, not grow longer. Therefore, if you are looking to grow your lashes, then this is not the product for you. Furthermore, this formula only works on lashes, and not on brows. Thus, it would not be a good idea to buy a product that works on one part while there are products that work on both the eyebrows and eyelashes. Think carefully before you decide to buy this serum. It might be an option to look further before you buy it, especially considering that there is no money-back guarantee.